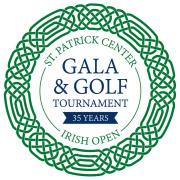 This year marks the 35th annual Irish Open Gala and Golf Tournament. Volunteers are needed for the gala on Saturday, June 2 at Saint Louis Union Station Hotel to assist with setup, raffle sales, and the silent and live auctions. For more information about volunteering for Irish Open, contact Samantha Decker at 314-802-0681 or sdecker@stpatrickcenter.org.